Lying in the Mediterranean Sea some 125km east of Dénia on the mainland and 190km south-west of Mallorca, Ibiza is the 3rd largest of Spain’s Balearic Islands. It has long had a reputation as a party island which is home to some of Europe’s most famous nightclubs but is also a popular destination for family holidays thanks to the lovely beach resorts scattered around its coastline. Until recently the island’s cruise industry was restricted by limited access to the port for larger vessels but significant investment in improved berths now allow it to accommodate ever longer cruise ships. This has led to a substantial increase in traffic such that almost 250,000 cruise ship passengers are expected to visit the island this year. Port d’Eivissa: Some smaller ships can navigate right into the heart of the old town where passengers are treated to beautiful views towards the Dalt Vila (upper town). There is no terminal building so disembarkation takes place on to the pedestrianised Carrer Andanes which is lined with shops, bars and restaurants. The adjacent ferry port deals with services to and from Valencia and Dénia on the mainland. Botafoc Dock: Larger vessels dock in the eastern harbour of Ibiza Port on the outer sea wall of the Botafoc Pier from where shuttle buses transport passengers into the old town. This is also a busy ferry port dealing with traffic to and from Barcelona and Palma de Mallorca. On Foot: With a reasonable level of fitness cruise ship passengers can get there on foot although they will require a solid pair of walking shoes to help navigate the cobbled streets. The main point of entry into the walled city is through the Portal de Ses Taules from where narrow streets wind their way to Plaça de la Catedral at the top of the Dalt Vila. By Taxi: As well as there being restricted access to motor vehicles in the Dalt Vila many taxi drivers aren’t keen to drive all the way to the top, preferring to drop passengers at the entrance or near the Hotel Mirador. 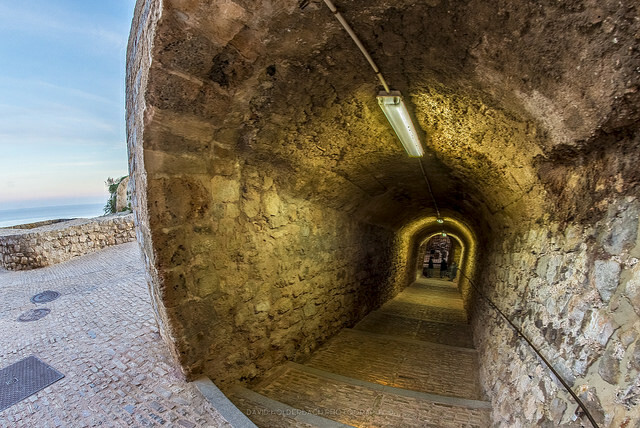 There’s a tunnel next to the hotel which leads to the top of the hill from where you can leisurely stroll back down to the port through the streets. If mobility issues make this an unsuitable option you could ask the taxi driver to wind his way around the narrow streets and drop you as close as possible to the cathedral. By Shuttle Bus: Cruise ships often arrange to have shuttle buses available which will transport passengers into the Dalt Vila. The hill on which the Dalt Vila stands was first occupied by the Phoenicians in the 7th Century BC. Whilst Roman, Byzantine and Moorish settlers developed its defensive role over subsequent centuries the walls we see today were only built in the 16th century to protect the town from Berber pirates. The six original bastions built into the walls complete with cannons pointing out to sea are some of the best spots from which to take in the stunning views over the port and across to the smallest Balearic island of Formentera to the south. Catedral de Santa María: Also known as La Catedral de Nuestra Señora de las Nieves, this building dates back to 1235 when a church was built here on the site of a former mosque following the Christian reconquest of the island from the Moors. 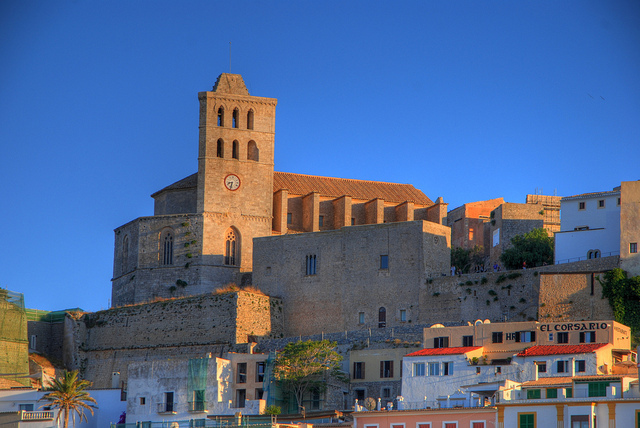 Castell de Eivissa: Ibiza Castle is a fortress standing at the top of the Dalt Vila near the cathedral. It is slowly being converted into a luxury Parador hotel. Churches: The 17th century Iglesia de Santo Domingo and the 18th century Capilla de San Ciriaco are two of the main religious buildings of interest. 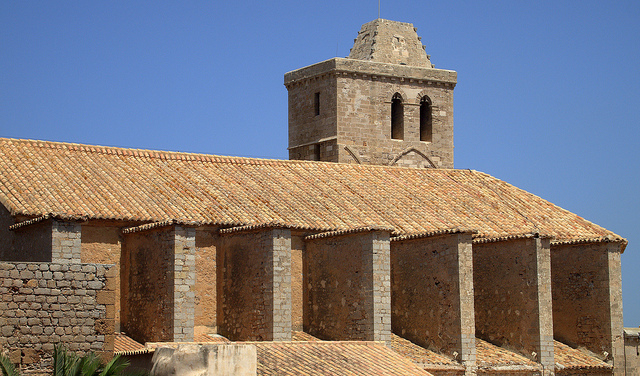 San Ciriaco is the patron saint of the island whose feast day is celebrated on 8th August coinciding with the Catalan conquest of Ibiza in 1235. Museo Arqueológico de Ibiza y Formentera (Plaça de la Catedral 3): The Archaeology Museum displays exhibits found locally from throughout the centuries dating back to prehistoric times. Museu d’Art Contemporani d’Eivissa (Ronda Narcis Putget): The Museum of Contemporary Art is most admired for the 18th century military building in which it is housed. As well as art exhibitions related to Ibiza there’s an underground archaeological site open to the public. Necropolis del Puig des Molins (Via Romana, 31): This ancient necropolis was set up by the Phoenicians in the 7th century BC. It is one of the largest in the world where around 4000 tombs have been discovered from all over the Mediterranean region. As well as the nightlife which attracts a young crowd to the island there are beautiful beaches all around the coastline which helps make Ibiza such a popular destination for family holidays. Fortunately, some of these beaches lie within close proximity of Ibiza Town so cruise passengers can spend some time relaxing there after sightseeing before heading back to their ship. The nearest beach to the Botafoc dock is Platja de Talamanca which is just a short walk to the north-east. From Ibiza Town you can visit Platja d’en Bossa which is a major resort lying 3km to the south which has a long, sandy beach. Nearer still is the Platja de ses Figueretes which is just on the outskirts of town to the south. You can get to all these beaches on a Water Bus which departs from the main harbour. 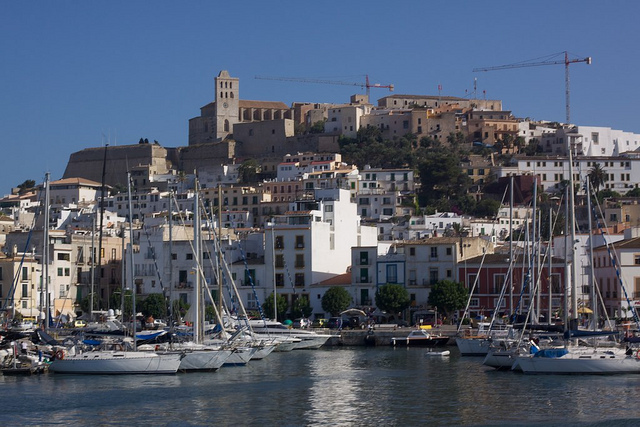 Lying across the bay from the Dalt Vila are the exclusive marinas of Ibiza Nueva and Botafoch. You are welcome to stroll around admiring the superyachts of the rich and famous which dock here. Surrounding the marinas there are a range of designer boutiques together with upmarket bars and restaurants which make this a lovely place to enjoy dinner in the evening if you happen to be spending the night in port. Ferry to Formentera: Lying just 6km south of Ibiza, Formentera is the smallest of Spain’s Balearic Islands. 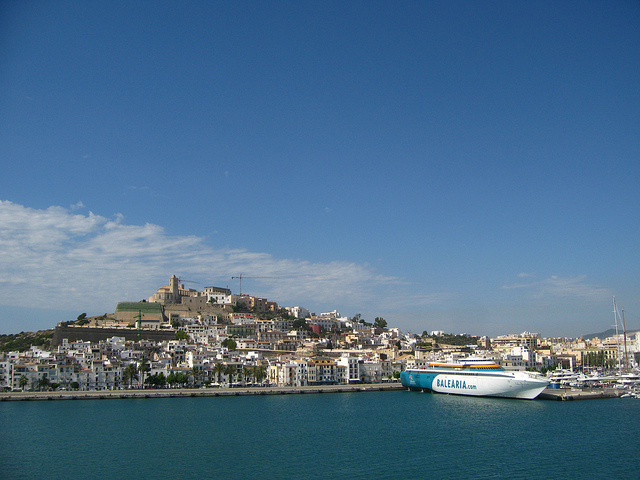 Frequent ferries depart from the harbour in Ibiza Town and take just 30 minutes to get there. A cheaper but longer alternative to the regular ferries is Aquabus who offer services from Ibiza port to La Savina on Formentera via Playa d’en Bossa. Wine Tour: Wine enthusiasts should book ahead for a visit to the small, family-run Sa Cova Winery which is located 20km north-west of the port in Sant Mateu d’Albarca. Visitors can sample a selection of local wines produced here accompanied by a lunch of delicious tapas dishes. A taxi or hire car would be the best way to get there. Sa Caleta: Located near the airport, just 15km south-west of Ibiza Port, are the ruins of a Phoenician settlement which date back to the 7th Century BC. The site was originally chosen due to its proximity to the nearby salt marshes. Such is the archaeological significance of the site that it has been recognised as a UNESCO World Heritage Site. A small Phoenician cemetery has also been discovered at nearby Cala d’Hort. A taxi from Ibiza Town or bus number 26 will get you there. Hippy Market Punta Punta Arabí: Every Wednesday during the summer months there’s a popular hippy market held at Es Caná which lies 20km to north-east of Ibiza Port. The is the original hippy market which has been running since well before the age of mass tourism. A novel way of getting there if time permits is on the Aquabus service which departs from Ibiza Town, otherwise you’d be best sharing a taxi with some fellow passengers. Ibiza Airport: Ibiza Airport lies just 10km south-west of the main town. Taxis and private transfers are widely available together with an Airport Bus (No. 10) which is a cheap way to get to the main bus terminal. Ibiza Hotels: You’ll find lower priced accommodation in the lower town and in the commercial area with the Dalt Vila being home to some really special places to stay. Take a look at Booking.com to get an idea of for a selection of good deals on what’s available and where in Eivissa.